Nilo W. Hovey was born September 22, 1906 in Cedar Falls, Iowa and received his early musical experiences in the public schools of the area. In performances with the Cedar Falls Municipal Band, he would often play any instrument needed to balance out a section, though his principal instrument was clarinet. While a student at Iowa State Teacher’s College (now the Univ. of Northern Iowa) he received his first teaching experience in the public schools of Dike, Iowa. He married the former Ruth Emily Sinden of Maquoketa, Iowa in December, 1927. Nilo Hovey had a very distinguished career in music education that spanned nearly six decades. He won national and international recognition as a conductor, educator, clinician, adjudicator, composer, and prolific author of instrumental guides and methods. He began his career in 1926 as Director of Instrumental Music in Hammond, IN public schools. During those 18 years he produced the first of many instructional books, one of which is a method for clarinet that remains in use today. Mr. Hovey next joined the faculty of Arthur Jordan College of Music at Butler University in Indianapolis, IN where from 1944-1957 he was director of the Concert Band and Chairman of the Music Education Department. 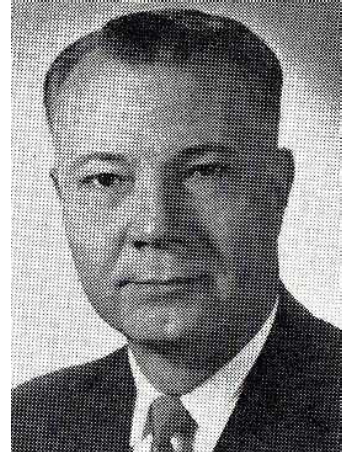 In 1957 Mr. Hovey became Education Director for the Selmer Company. During his 18 year tenure with the company in Elkhart, IN he conducted regional and All-State high school bands in 46 states and five Canadian provinces. Mr. Hovey served as president of the American Bandmaster’s Association in 1970-71 and the Music Industry Council from 1962-64. He was guest conductor of many Intercollegiate and All-State High School Bands, the Royal Canadian Air Force Band, the U.S. Navy Band, the U.S. Army Band, and the U.S. Air Force Band and was one of the few civilians elected to honorary membership in these last two groups. Numerous solos and woodwind ensembles, instrumental methods, and books of instructional material written or edited by Hovey are widely used in the schools in the United States and Canada. Nilo W. Hovey was truly a band director’s band director. He passed away in March, 1986.